CSM has been awarded the Alliance for Workplace Excellence’s 2018 Seal of Approval, the Health & Wellness Seal of Approval and the Diversity Champion Award. From left are CSM Trustee Chair Theodore L. Harwood II, CSM Associate Vice President of Human Resources and Payroll Services Ivan L. Smith, CSM President Dr. Maureen Murphy and Vice President of Human Resources and Organizational Development Craig Patenaude. 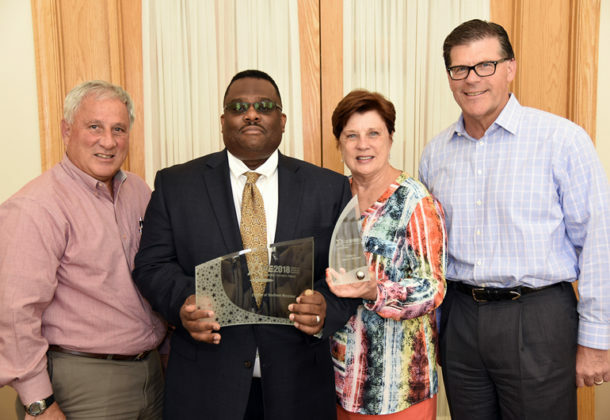 The College of Southern Maryland has received several Workplace Excellence Awards from the Alliance for Workplace Excellence this year, and they were announced at an annual award luncheon in Gaithersburg on June 8. The college earned AWE’s 2018 Workplace Excellence Seal of Approval, plus the 2018 Health & Wellness Seal of Approval and the 2018 Diversity Champion Award. This marks the 13th year that CSM has earned the Workplace Excellence Seal of Approval. Winners of the award are evaluated for their programs in communication, employee growth, diversity, life-work balance, and more. The Health & Wellness Seal of Approval is earned by employers who provide onsite fitness facilities and innovative programs for employee health and wellness. CSM has a Time-Off for Fitness program that allows employees to participate in wellness activities on CSM campuses, using up to one hour per week for fitness activities, with the approval of their supervisor. Diversity champions are employers who are committed to a diverse and inclusive workforce. The champions recognize the value of diversity in all aspects of the workplace. Applicants for the award are recognized based on multiple components such as leadership, workplace demographics, and services diversity. All AWE Award recipients are subject to a rigorous assessment process led by an independent review panel of business professional and master’s- and doctorate-level students in business, industrial and organizational psychology, human resources, environmental science, public health, and diversity and inclusion fields. AWE is a 501(c)3 non-profit organization that was founded in 1999, and is dedicated to growing the number of excellent workplaces within the business community through education and recognition, as a way to enhance the quality of life of its citizens and empower economic growth. For information on AWE, visit its website. CSM is celebrating its 60th anniversary this year. First established as part of the continuing expansion of the community college in America, Charles County Junior College opened Sept. 17, 1958. The La Plata Campus was begun at its current location in 1968, with college services expanding to St. Mary’s County in 1978 and Calvert County in 1980. For information about the college’s history, visit the CSM website. Today, the college is a regionally accredited community college which provides programs and services with a special focus on local workforce development to maintain and grow a healthy economy and community. CSM serves more than 24,000 credit and continuing education students at its campuses in La Plata, Hughesville, Leonardtown and Prince Frederick, as well as a Higher Education Center shared with University of Maryland University College in Waldorf and a Center for Transportation Training in La Plata. For information on employment at CSM, visit the college’s website.